We made it home after last season via Seattle, San Fran, LA, Fiji, Port Douglas (Gt Barrier Reef) Melbourne, KL and Dubai. Yet another once in a lifetime trip which we have done before and no doubt we will repeat in a couple of years ! Having said that there is still plenty of racing in September to come and this year we will be keeping the boat in the water right up to the races for the Falmouth Oyster Festival in mid October. Usually I would be spending a few weeks around this time back in Fernie catching up on the news and taking in the fall colours but unfortunately this year that isn't going to happen. Everyone can remember a couple of years ago when the bombshell dropped that Lynda had been diagnosed with a mediastinal lymphoma and need some intense chemo therapy. Well don't worry she is approaching her two years in remission and everything is totally clear so from now on the chances of a reoccurrence become less and less. No, she has now found she has very bad arthritis in her right hip and an immediate operation to replace the joint is needed, scheduled for Saturday week. Whilst this is a real pain in more than just one sense of the word it is at least easily treatable with a very common operation even if it does keep us from our usual fall trip. Prognosis is that she should be fit to travel early December and be able to do some light skiing by the end of the season - after that it should be back to normal for both sailing and skiing. 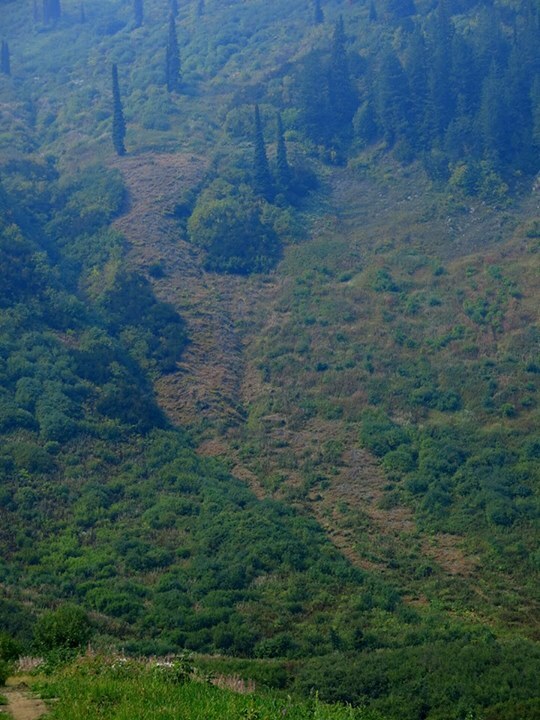 One piece of work is in Little Snake in the ski out into lower Cedar which now looks like you will be able to take Snake Main all the way down without having to traverse hard left or right to avoid the bushes. Now I know many locals hate Kangaroo and think it is the work of Satan himself, but I still maintain that it is the only interesting route down from Haul Back Top to Boom Load unless you bush whack your way into the lower parts of Linda's. Rumour had it that the hill was going to neglect Kangaroo and leave it to die of natural causes as it grew over due to it's lack of popularity. Well, this all goes to show that you can't trust everything you hear in the Griz Bar and I have to say that the pictures look like they have done a pretty good job of giving the run a haircut - well done guys and thanks. Of course this now leads us on to discussing what are the next runs that might get this treatment next summer and consensus opinion seems to be coming down on the side of the lower parts of the big three. To be fair last year the snow base was so low that we never really got the snow creep that tends to flatten out the alders in that area so maybe with a big snow base this winter things will be much better. All we can do is keep our fingers crossed and ski whatever turns up. 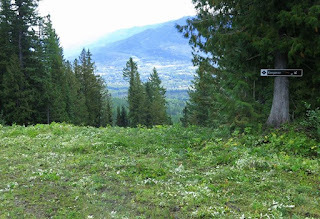 As a precaution we have bought the 4 area pass this year which at early bird prices was only about 80 bucks more expensive than the Fernie pass. As least this means that if we need to do a road trip up to Kicking Horse to get better snow we won't have to fork out for a day pass on top of any other expenses. Just for the record I have been thinking seriously about giving up on the blog. It is a big commitment every day of the season and even though the number of hits has grown to about 1000 a day at peak times there has to be a time when it becomes past it's sell by date. No need for immediate panic as I have decided to continue for at least one more year. My policy will remain as always to give fair but honest reports on the conditions in Fernie - put another way my aim as ever is to comfort the afflicted and afflict the comfortable. Finally a tip for anyone thinking of flying out to Fernie for the season from the UK. I have checked the flight prices on Air Canada for flying from London Heathrow to Cranbrook via Calgary for the season return and they pan out at £890 a time. Flights from Dublin to Cranbrook via Toronto and Calgary which still take place all in the same day are £535. Now even after the £100 for a Ryanair cheapie with hold baggage to get to Dublin this still puts you £255 per person ahead of the game. My only worry is that staying with my Irish sailing/skiing buddies may take a significant chunk out of the £510 that Lynda and I will save by doing this - but worth thinking about. So, that's it, look forward to seeing you all in December - keep your stick on the ice. Being a keen reader of your daily musings I for one am glad to hear you are going to continue for one more year. Our family has been regular visitors to Fernie for the last 12 years. Although I live in Scotland now I am originally from Penzance so we also spend time in Cornwall. I look forward to the time when work commitments let us spend more time is both places as you and Lynda do. We did meet one year in the Lost Boys Café. Now that our "kids" are no longer kids we will probably frequent the Griz a bit more often and will look out for you on our next visit which is planned for two weeks up to the 10th January 2016.